LOS ANGELES (Oct 17): Netflix Inc.’s Cinderella story isn’t over just yet. The world’s largest paid online TV network added far more subscribers than analysts forecast in the third quarter and issued an upbeat outlook for the current three months, rebounding from a slowdown earlier this year. Netflix signed up 6.96 million customers in the quarter, according to a statement Tuesday, boosting its global total to 137.1 million. 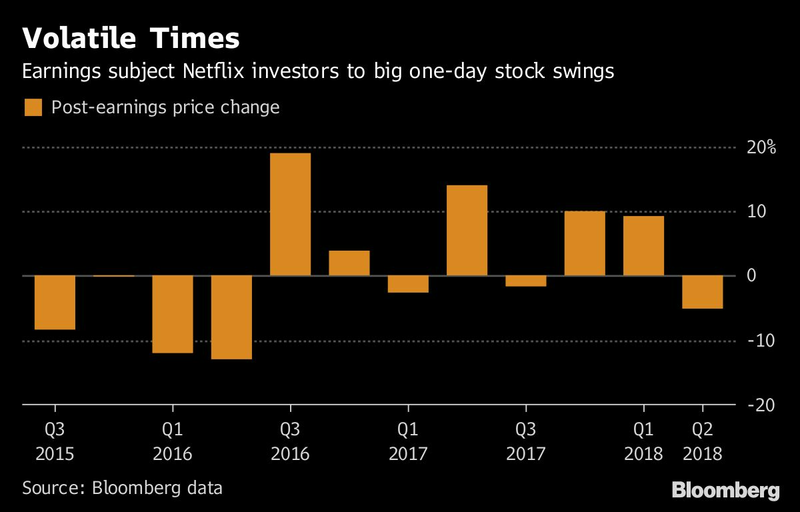 The results should extend Netflix’s reign as one of the best-performing stocks on Wall Street, giving the company leeway to spend billions of dollars more on original programming. Netflix expects to add 28.9 million customers this year, setting a new record for the 21-year-old company. International markets accounted for 84% of new customers, the company said, and constituted 57% of its overall customer base. That helped lift profit more than threefold to 89 US cents a share, beating the 68-cent average of analysts’ estimates. Sales grew 34% to US$4 billion, meeting Wall Street forecasts. In all, Netflix added almost 2 million more subscribers than the 5.09 Wall Street expected. 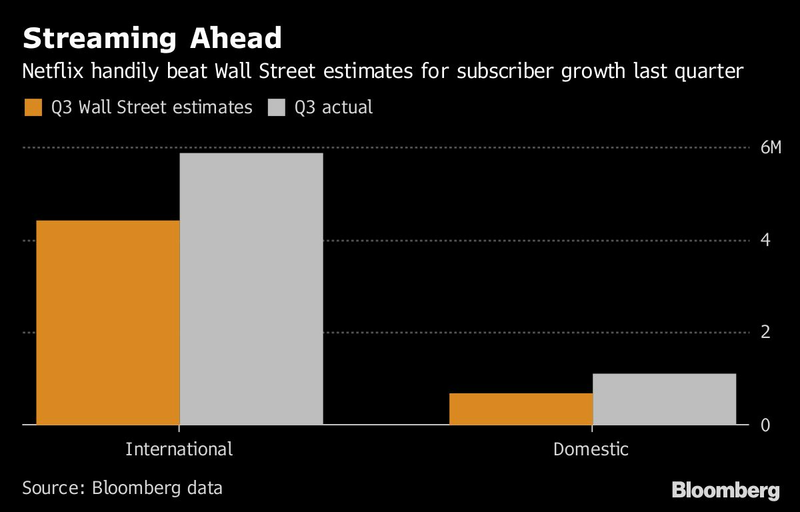 This quarter, the company expects to sign up 9.4 million new subscribers globally, far above the 7.18 million average of forecasts compiled by Bloomberg. In the US, where Netflix can now claim almost half of households as users, the company expects to add 1.8 million new customers this quarter, bringing the domestic total to 60.3 million. Netflix shares typically fluctuate widely after earnings, and this quarter was no exception. The stock rose as much as 17% in after-hours trading to US$405, and the market value of the company once again challenged media giants such as Comcast Corp., the largest US cable provider, and Walt Disney Co., the world’s largest entertainment company. Netflix never identifies which shows are most successful. Nor does the company release viewership figures for programs, contending that subscriber growth demonstrates the popularity of its entertainment slate. The company has parlayed that into huge gains for investors. The shares are up 80% this year. Netflix has upended the economics of pay TV by offering customers thousands of programs on-demand for a monthly fee that’s a fraction of the cost of a multichannel cable or satellite package. The number of people paying for cable or satellite has fallen in recent years, denting profit at the world’s largest media companies and triggering a wave of mergers. Media companies that once sold programs to Netflix for hundreds of millions of dollars are now building their own on-demand services to compete head on. Disney and AT&T Inc., the parent of Warner Bros. and HBO, are each looking to introduce new services next year -- after completing takeovers of other companies worth a combined US$160 billion. Netflix plans to spend about US$8 billion on programming this year. While most of that still funds shows licensed from other companies, original programs account for a growing share. This formula has worked as long as Netflix kept growing at a rapid pace. The company, founded in 1997 as a DVD-by-mail service, posted its strongest years of subscriber growth in 2016 and again in 2017 -- in its 20th and 21st years of operation. International territories account for most of that growth and remain the key to the company’s future. Those markets boosted Netflix again in the third quarter, contributing 5.87 million new customers. Netflix doesn’t break out its customers by market, with the exception of the US, though most analysts agree the UK., Brazil, Canada and Mexico rank among the company’s largest.